Family vacation and kid friendly holidays! HomeExchange knows that organizing family holidays can be difficult and expensive. Exchange your home and organize the best holidays for your family. A home exchange offers family fun activities and kid-friendly holidays at a fraction of the cost. Organize your family holidays with HomeExchange! Family holidays fun with HomeExchange! Travelling for family holidays can be a fun experience for everyone but can be difficult to organize. It takes time and money to plan the perfect family activities for family members of all ages. HomeExchange makes your family holidays fun, easy and affordable. Thanks to HomeExchange, you can save tons of money on travel accommodations. Whether your family is big or small, we have the best holiday homes, in the best destinations, for the best family holidays. 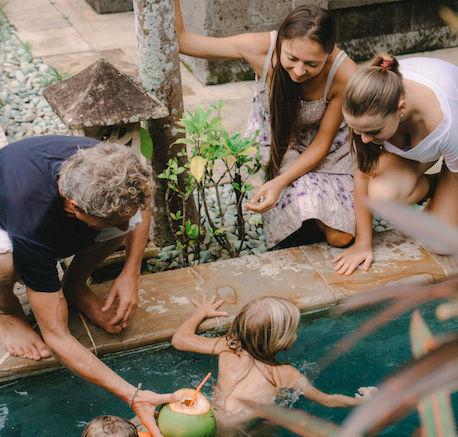 Don't waste your family holiday budget on a hotel; organize a home exchange and use the extra cash on exciting family activities that the whole family will love. Exchanging your home gives you a family holiday experience like no other. Imagine taking a family break in another country and enjoying the daily local life as a family. Exchanging your home with HomeExchange gives you a family holiday experience like no other and creates unforgettable family holiday memories. Discover your dream holiday home! "The platform lets you discover a city in a completely different way than a hotel..."
"A convenient and user-friendly system for a weekend getaway or a vacation for less!" "The best way to meet new people and discover beautiful horizons."